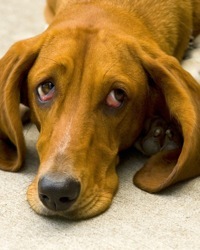 Dog Guilt is Imaginary, so Science Says :: Do Dogs Have a Conscience? I grew up with a dog. I remember talking with him as if he were a friend, getting happy when he wagged his tail, getting concerned when he looked bored, basically, I remember treating my dog as if he were a human, an equal. People could tell me all day long that my dog didn’t understand what I meant when I asked how he was doing, but I knew that wasn’t true. After all, he was a dog, a best friend. He understood everything I said and asked, and when I punished him – “Bad boy, Dino!” – for doing something inappropriate inside the house, he felt guilty for his screw up. I had faith in my dog. I believed he could learn and grow with me. Together we would become better people. Dogs are cool like that. LOOKS: Guilty (e.g., avoids eye contact, drops its tail, lies down, rolls onto its back, slinks off). THINKS: Who knows? But a dog’s guilty look is a reaction not to whatever the dog did, but to its owner’s scolding, according to a study by psychologist Alexandra Horowitz of Barnard College. One telltale bit of data: dogs gave the guilty look when their owners mistakenly thought the dogs had eaten a forbidden treat, even when the dogs were completely innocent. More study – a lot more – is required to establish whether dogs have a conscience. Science always tries to oust faith. But what do you think? Can it be shown that dogs have a conscience?